I’m feeling a lot like not wanting to write today, but have generally been good about writing regularly (a post every day for more than five weeks). 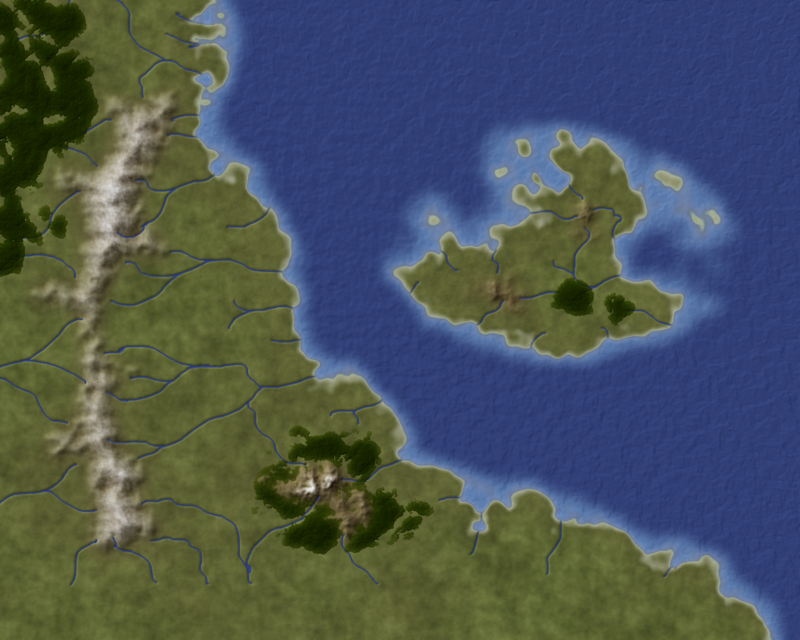 Instead I thought I’d do something different, practice a bit of map drawing. It’s been a while, I’m relearning techniques I haven’t practiced in over a year, so things aren’t quite as polished as I’d like. Ah well, this just means I’ll get better, yeah? 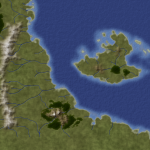 Case in point, my ‘rivers to nowhere’ at the bottom of the map — I forgot to scroll the silly thing when drawing the rivers and they just end. River police are gonna get me…. Who knows, I might do these irregularly, I may decide to start a regular feature where I draw a picture of a place that doesn’t exist. The places feature sounds like a good idea, perhaps with an invitation for people to suggest things about the places depicted. For instance, that wide bay with two natural anchorages at the north end of the mountain range combined with the proximity of the largest forests suggests to me that that there is a nation there which is a significant naval power. That’s an interesting idea. Start with a map (possibly the idea provided by a reader), then flesh it out into a campaign region. Didn’t you at one time consider having Terrain Tiers? I did consider something like applying tier criteria to regions, yes. ‘Expert regions’ are where hostile humanoids and giants live, some lower-grade monsters, and so on. Geography is dramatic but still credible. ‘Master regions’ are where you start finding the weirder things — aberrations, implausible or even impossible geographic features, things like that. For instance, the Burning Wood (http://www.kjd-imc.org/2007/07/23/burning-wood/) might be Master or so, the Ghost Hills (http://www.kjd-imc.org/2007/07/23/ghost-hills/) might be Champion, but Storm Mountain (http://www.kjd-imc.org/2007/07/24/storm-mountain/) might be only Expert. The regions can be pretty small. A temple where a ‘champion adventure’ is going to take place is going to have some downright freakish properties, while your typical shrine (Basic area) is going to be pretty undramatic.